Brilliant name, eh? 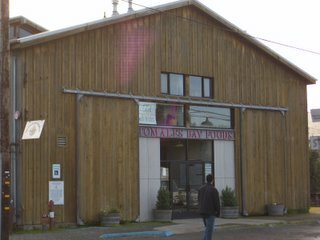 Actually, I guess the name of the store is Tomales Bay Foods, but their cheeses are made under the Cowgirl Creamery banner and I think that's just way cooler. The cowgirls in question are veterans of Bay Area restaurants such as Chez Panisse and Bette's Oceanview Diner. We were graciously treated to about 6 samples of their cheeses that we chose until we decided on one. 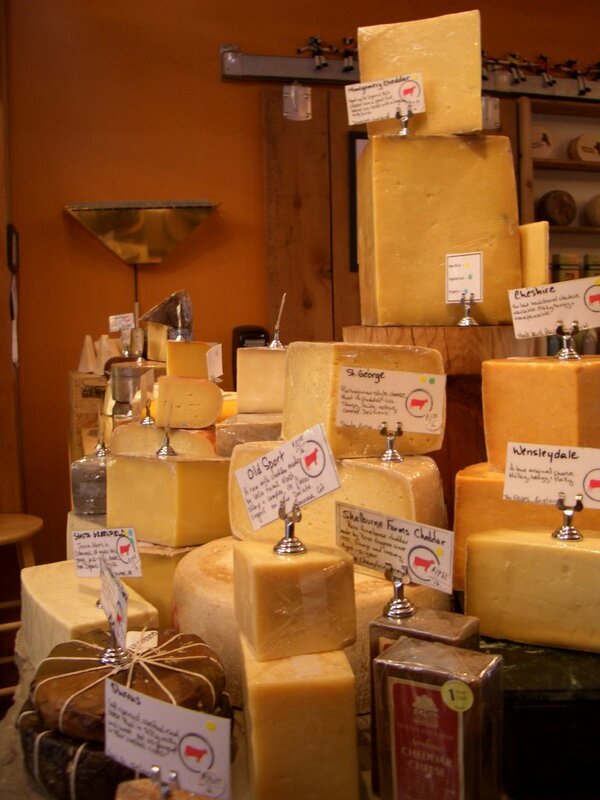 If the cheeses at the Marin French Cheese Co reminded me of the farm, these cheeses reminded me of wine. Each one burst with combinations such unique and elegant notes that I usually become aware of at wine tastings. We decided on the Lincolnshire Poacher (this link goes to the "Cheese Library" on the Cowgirl Creamery site, which is well worth checking out) from Neal's Yard Dairy. Even though it is associated with cheddars, it reminded me of a parmigiano-reggiano, but with a softer tooth, and with smoky and bacon-y notes, though it is a not a smoked cheese; it's like the Chardonnay of assertive cheeses. It was only after we left to drive up the coast that I realized that I'd wanted to buy a cheese actually made by the Cowgirl Creamery. I guess next time, or when I make my way to the Ferry Building at the San Francisco Embarcadero, maybe I'll pick some up the Cowgirl Creamery Cheese Store that they opened in 2003. The only dark spot of our visit was when we got home and opened the cheese from its paper wrapping. There were two small veins of blue mold. Such mold wasn't on our samples, but I feel like the counterperson must have seen them when giving us samples and when she cut it; so it should have been acceptable? At least, I hope. Since we weren't warned about it and don't seek out mold to eat, I had to cut those veins, and then some, out.... which made me feel a bit deprived. And ripped off. I just tried Googling about this issue and Lincolnshire Poacher in general. The mold issue doesn't come up. BUT it is actually made of unpasteurized milk, which I thought was illegal in the US. It turns out that cheeses made of unpasteurized milk are only illegal if they are aged less than 60 days. Lincolnshire Poacher is aged a minimum of 18 months. Hm...They are next open on Wednesday..... I may call to ask about the mold. I'm curious.